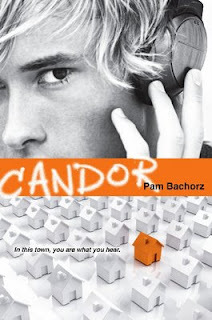 Candor by Pam Bachorz. Egmont USA. September 2009. Reviewed from ARC supplied by publisher. First: Great cover. I love how it conveys something about the book and also entices a person to pick it up. Second: The back of the ARC says "Stepford makes the perfect wife, but Candor teens are changed for life." Oscar Banks' father has created the picture perfect town of Candor. It's not just the buildings and the landscaping that is perfect -- the people have been made perfect, also. Especially the teens. A little brainwashing to "help" a teen be the best son or daughter they can be. Best and perfect as defined not only by their parents, but also by Oscar's dad. And Oscar is the poster boy for just how successful Candor is with fixing teens. What Dad doesn't know is that Oscar knows what is going on... and has been helping kids escape. Third: The author has a book playlist up at her website. I listened to it as I was writing this up. Great songs that convey the tone and feeling of the book. Thanks so much for "teasing" CANDOR! I am psyched that you enjoyed the book playlist. I loved putting it together. This looks great- thanks for posting! Am psyched for its release. Wonder what else is up the author's sleeve? Ooooh. Want to read THIS. The Stepfords were a delicious horror that survive to this day -- this sounds like another fabulous makes-its-mark YA book.